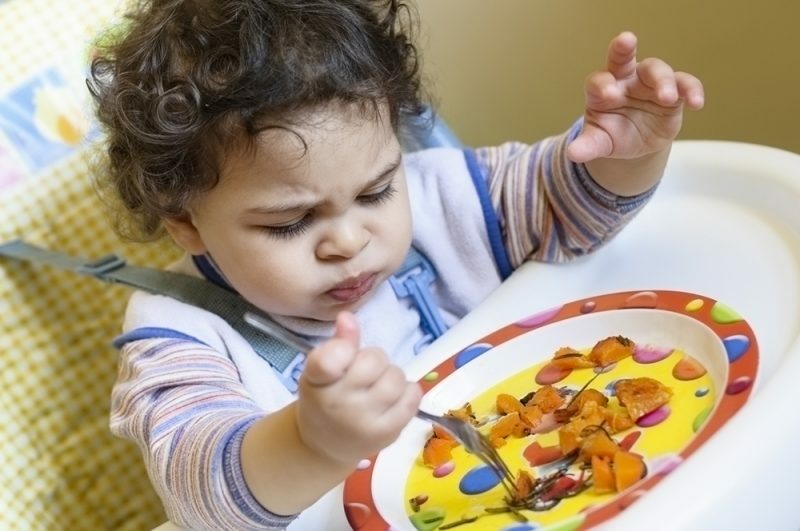 Toddlers are notoriously picky eaters as they become more interested in exploring the world around them than eating. Often their appetites vary from day-to-day. As they struggle for independence, they may insist on the same food for 3 days in a row then suddenly refuse to eat it. “Rather than worrying about every meal or day when their toddlers didn’t eat well, parents should look at the total weekly intake to make sure they’re getting the nutrients they need,” said Sally Phillips, a registered dietitian at Akron Children’s. To make sure your toddler gets the necessary nutrients, offer a variety of healthy foods from each food group at every meal. A toddler’s tummy is about the size of her fist so she’ll need small, nutritious meals and snacks. Cookies and sugary drinks will fill her up, so she won’t have room for the foods she needs most. Healthy snacks such as whole grain crackers and cheese, diced fruit or yogurt will help ensure her diet is balanced. Water is a good alternative to sugary drinks or juice to quench thirst in between meals. Set regular mealtimes without distractions from the TV. Serve 3 main meals and a morning and afternoon snack, spaced about an 1 ½ to 2 hours apart. Encourage all caregivers follow the same schedule and practices at mealtime. Discourage your child from grazing, even if she didn’t eat well at the last meal. She’ll eat better at the next one. By learning what it feels like to be hungry and full, she’ll also learn to eat when she’s hungry. Set a good example by eating healthy foods with your child. Serve at least one food you know he likes at every meal. Introduce a new food when she’s really hungry. If she won’t eat it, keep trying. It may take up to 10 tries before a child accepts a new food. Use condiments or flavorings your child likes, such as ketchup or cinnamon. Serve small portions on small plates. A typical serving is 1 tablespoon for each year of age. At mealtime, make sure your child is seated at the table in a high chair or booster seat to reduce the risk of choking. Being seated at the table will make your child more comfortable and easier to control. It also promotes family mealtime. Cut all foods into bite-sized pieces. Don’t offer foods that are choking hazards such as raw carrots and celery, raisins, popcorn, tough meats, nuts and chips. Sometimes picky eating is related to feeding problems such as gastroesophageal reflux or swallowing difficulties that make eating unpleasant. If your child repeatedly cries or refuses to eat, talk to the doctor to rule out another problem.